The Industry was an online publication launched in 2011 by Drew Wilson and Jared Erondu to bring design-oriented journalism to the startup world. 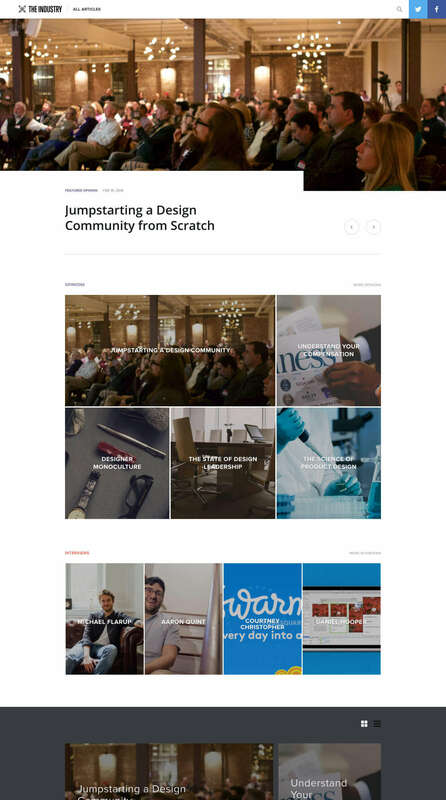 The site offered news, interviews, commentary, and a popular design podcast. I submitted an op-ed to The Industry in 2012 and was asked to come aboard as a contributing writer. Eventually I became the opinion editor, writing my own hot takes and soliciting essays from fresh voices throughout the design industry. Finally, I was appointed as managing editor, which I remained until The Industry was put on hiatus in 2016 so the team could focus on new projects. Around 2014, we decided that the Industry website could use a refresh, so designer and editor-in-chief set about designing the new site. Over the course of several video chats, he fleshed out the design while I built it as a custom WordPress theme; by passing our work back and forth, we were able to iterate quickly, going from concept to production-ready site in just a few weeks. The new layout made articles cleaner, more legible, and more shareable than they were before. The site included a Related Articles section that could be toggled between a grid view and a list view, including beautiful and performant loading animations. The site is now defunct, but it lives on through screenshots and writing that I remain proud of. Over the course of my time working at The Industry, I published over 100 articles, ranging from commentary on Twitter’s new logo to a deep dive into how Dieter Rams’ 10 Principles of Good Design apply to digital work.